News Flash! Powerful PowerPoint for Educators, 2nd Edition, is on the way, due to be released in May 2012. It will be fully updated for PowerPoint 2010 and 2011 and include additional information on the basic level (explaining more non-VBA interactive features) and the advanced level (explaining a few more advanced VBA tricks). Buy the Book - to find out options for purchasing the book. Examples by Chapter - to find electronic versions of the examples in the book, suitable for downloading and editing for your own purposes. Examples from Real People - to find examples from real people, including example made by the author's students and other contributors to this site. More Tricks - to find more PowerPoint VBA tricks that were not included in the book (maybe in the 2nd edition). Errata - to find corrections for any errors in the book. About the Author - to find out information about Dr. David M. Marcovitz, the author of this book. Contact the Author - to find out how to contact the author to ask questions or just to tell him how great the book is. Other Resources - to find other resources about PowerPoint and VBA. If you don't own the book, here is some detailed information about the book from the preface. PowerPoint 2007 brought about many changes in version 2007, including introducing some bugs. Some of that is discussed in the Errata section of this Web site, but I have not revised the book to update it for 2007 (and 2010). To hold you over until that happens, here are some videos that go over some things that might be helpful. Most of them relate to differences between 2007 and earlier versions. Most educators have created simple presentations with PowerPoint. PowerPoint is a fine tool for adding media to a lecture, but it falls flat when creating interactive lessons for students to use while sitting in front of the computer. That is, it falls flat unless you use the built-in scripting features of PowerPoint. create rudimentary multiple-choice tests (clicking on a button with the correct answer takes the student to a slide that says “correct,” for example). While this interactivity is useful, it is also very limited. VBA extends this to nearly unlimited dimensions. With VBA, you can change the content and appearance of slides based on student input, ask for and process typed input, add additional slides, hide and show graphics, and much more. Scripting might not be a useful technique when used with a stand-alone programming language, but the real power of using VBA with PowerPoint is not merely that VBA is an accessible scripting language but that it is built into PowerPoint. One of my students created a presentation about Hawaii. It included pictures, videos, recorded voices, and links to Web sites. All of this used traditional PowerPoint technology (no scripting required). On top of that, it added an interactive menu and a quiz with feedback about how well the user did on the quiz. Building all of this from scratch with a programming or authoring tool could be an overwhelming task, but 95 percent of the presentation was done with traditional PowerPoint tools (things most teachers already know how to do or can learn within a couple of hours). When a few scripts are added on top of the traditional PowerPoint tools, the results are rich not only with media but also with interactivity. This book can be used as a stand-alone book in a multimedia design class for educators or as a companion for books like Ivers and Barron (2002) or Agnew, Kellerman, and Meyer (1996), which focus on multimedia design and using multimedia projects in classrooms but do not deal with a specific technology for implementing the projects. It also stands by itself without a class. 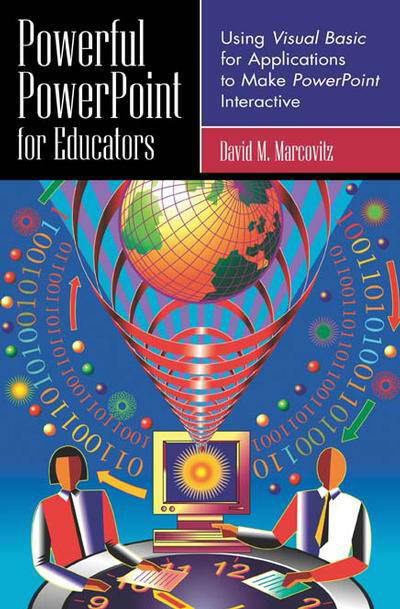 Anyone with basic PowerPoint skills can sit down with this book and begin to create powerful educational material for themselves, their colleagues, their students, or their own children. Chapter 2 begins to explore some of the traditional interactive multimedia features of PowerPoint. Adding pictures, sounds, buttons, and hyperlinks is not difficult, but many PowerPoint users have never used those features before. Chapter 3 introduces VBA. You’ll understand how VBA fits into the world of object-oriented programming and how that affects you as a scripter. As a scripter, you won’t have to understand all of VBA and object-oriented programming, but understanding objects and how to manipulate them will help you understand your scripts. Chapter 4 begins the heart of the book as you start to learn about scripting with VBA. You’ll learn how VBA is connected to PowerPoint and how to write and run your first script. You’ll also learn about keeping your scripts private so your students can’t look for the answers in your scripts. Chapters 5 and 6 build your bag of scripting tricks. As a scripter, you will be interested in taking scripts directly from these chapters and applying them to your own purposes. While each chapter contains examples that you can use right away, Chapter 7 focuses on examples that you will be able to use to create quizzes and tests. Once you have completed Chapter 7, you will have a large bag of tricks that you can use by copying scripts directly from the book and possibly creating some on your own. Chapter 8 describes some more tricks that you can use, particularly if you are ready to modify some of the ideas in the book for your own purposes. It ends with a powerful example that I use with my daughter as she is learning to read. Once you have mastered a large bag of tricks, you might need some help correcting your mistakes. Whenever you write scripts, even if you just copy them from the book, you are likely to make a few mistakes. Fixing mistakes is called debugging, and you will learn some of the secrets of debugging in Chapter 9. By the time you finish Chapter 9, you will be excited to create things yourself, but you might want to share your knowledge with your colleagues and your students. Some of them will share your enthusiasm and borrow your copy of this book (or better yet, buy their own copy) and dive right into powerful PowerPoint. Others won’t be ready for the technical challenge. Chapter 10 describes how you can use templates, so your colleagues and students can take full advantage of the power of VBA scripting without knowing any of it. You can use what you learn in Chapter 10 to provide a template for your colleagues or students with the scripting already done for them (by you).